How I Pack with Packing Cubes, Eagle Creek Load Warrior 28, and a Giveaway! How I Pack with Packing Cubes, Eagle Creek Load Warrior 28 Review, AND a Giveaway! When I told Zombie that I had about 15 Kilos check-in luggage allowance for my trip to the Philippines, he almost choked on his drink, trying hard not too chortle too much. I’m a woman of many contradictions. I may be an adrenalin junkie and jump off certain cliffs but I hyperventilate at the thought of not having packed an essential comfort item. Alright, hyperventilate may be a bit of an exagerration but I just don’t get to sit still when I know I’ve missed something. So, yes I’m not embarrassed to admit that I’m not a light packer. Last month, I flew to the Philippines for a very fun and adventure packed trip. I knew that the trip would be filled with physical challenges, but the challenge that I came head-to-head with the most was to keep my luggage under or just a little over 15kg. Since 2013, my packing life has been changed drastically when I discovered packing cubes. And though they did help me to not overpack, I always used them with large sized suitcases. 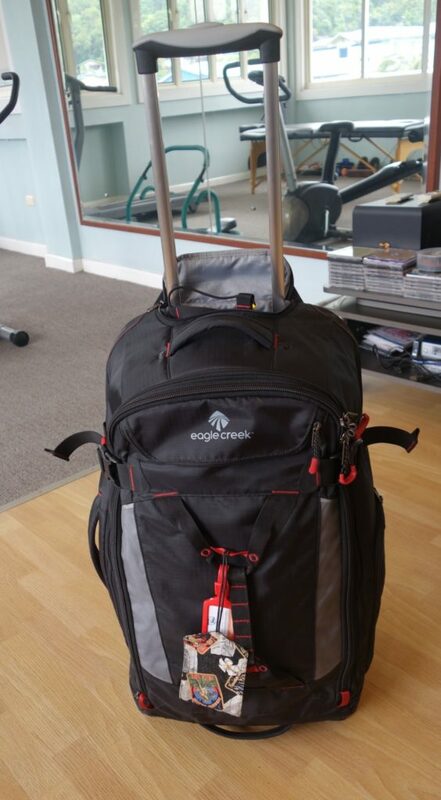 To help me face this packing challenge, I decided to take with me the Eagle Creek Load Warrior 28. This bag is available in 20, 25, 28, 32, and 36 inches long variety. I went right for the middle size (28 inch) as this seemed to be the perfect size for a 2-week trip for me. Too large to carry-on, but very compact and just right to check-in. Now before we get to the fun part (packing), let’s get to the numbers that matter first. The Eagle Creek Load Warrior performed wonderfully. Sure it had scratches on its wheels and stand after the trip, but that is to be expected after all the travelling I’d done. But it did hold up pretty well. 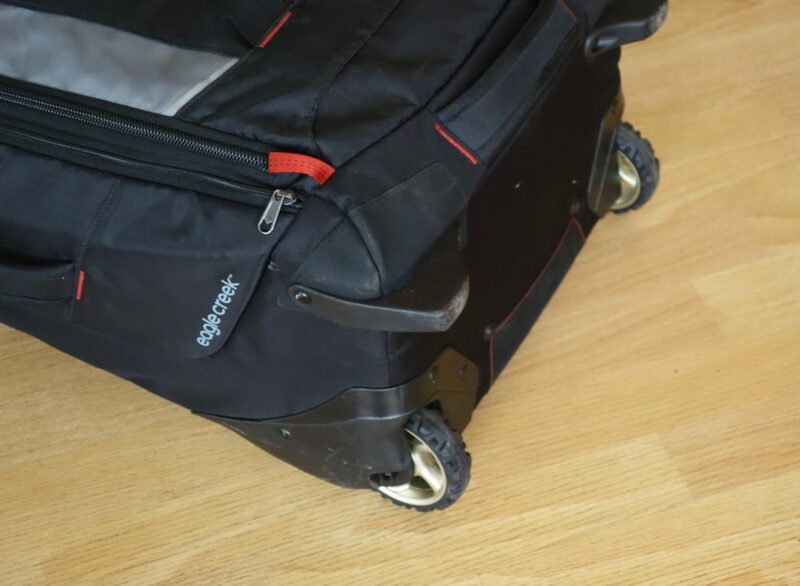 The zippers are very sturdy, the wheels are made for rough roads (and not just smooth airport floor surfaces). Let’s have a closer look at this, shall we? 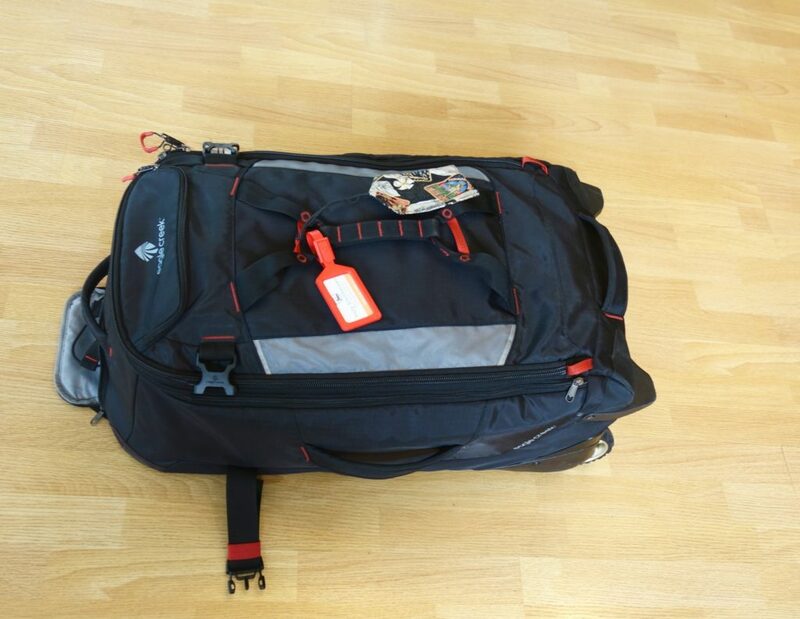 These photos show how the bag exactly looked like after the trip. I also loved that it has multiple grab handles. This means that I can pick this bag up however angle it may appear on the conveyor belt at the airport. This feature proved really handy, especially when you’re travelling by yourself. 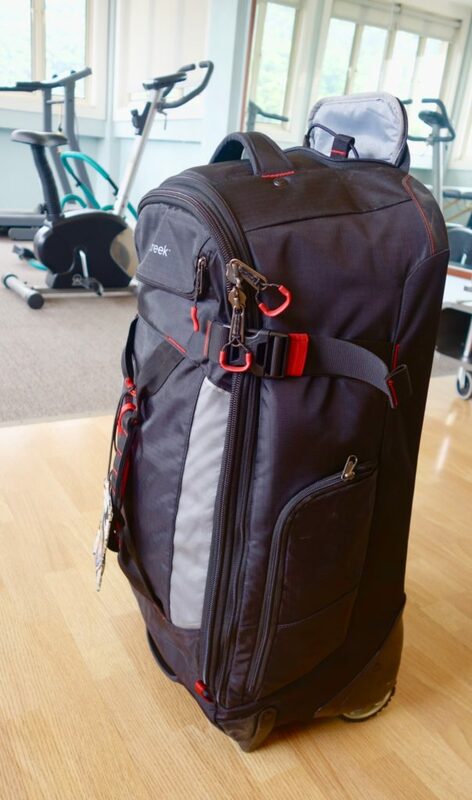 The wheels are really sturdy, especially as I’d dragged this bag on rough roads, street roads and even sand. I liked that it has both interior and exterior compression straps. This really helps in keeping things inside the bag in place and organised. The exterior straps helped in keeping the size to a minimum and also maintained the bag’s balance. A great feature of this bag is the laundry chute in the front cover/flap. This is a zipped chute that goes deep. 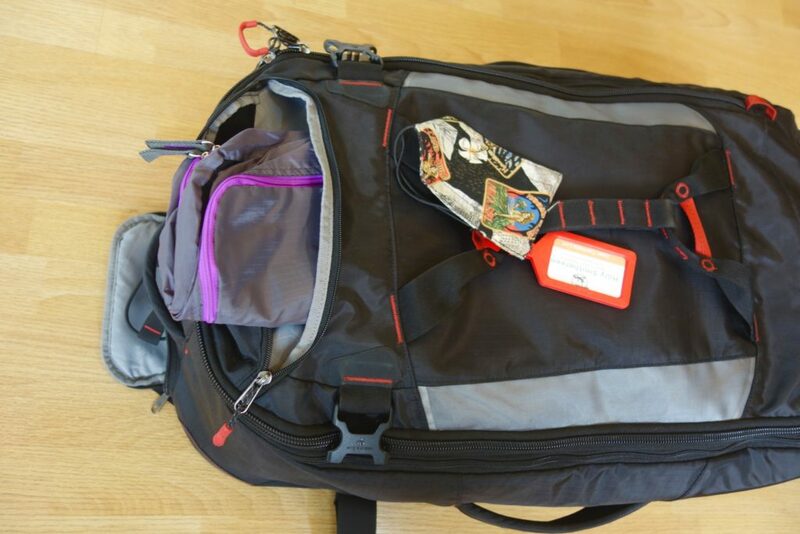 It’s used to store used and dirty clothes, a great idea to keep separate from the interior of the bag. I still used a separate laundry / dirty clothes bag for this chute (not included in the bag) because I liked to just open the chute and grab the entire laundry bag for washing. There’s this nifty little feature that’s stowed inside the luggage handle compartment. It has a fancy name (Stowable Equipment Keeper), but it pretty much doubles as a bottle opener, and as something to hang extra objects outside the bag. Now, I have to also credit the success of my packing challenge to the packing cubes. As I said, these little cubes really drastically changed my packing life since 2013. And it proved to be really useful on this trip, when I had limited space and weight allowance. So I do have a stash of packing cubes that are over 2 years old but they hold up really well. 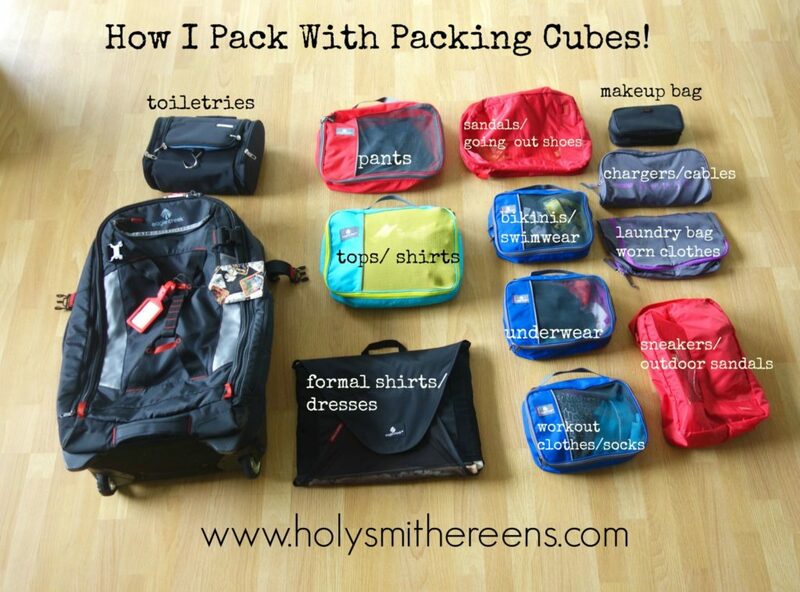 How I pack with packing cubes! So 1 Bag, 1 Packing envelope, 1 toiletry bag, 1 makeup bag and 9 packing cubes. 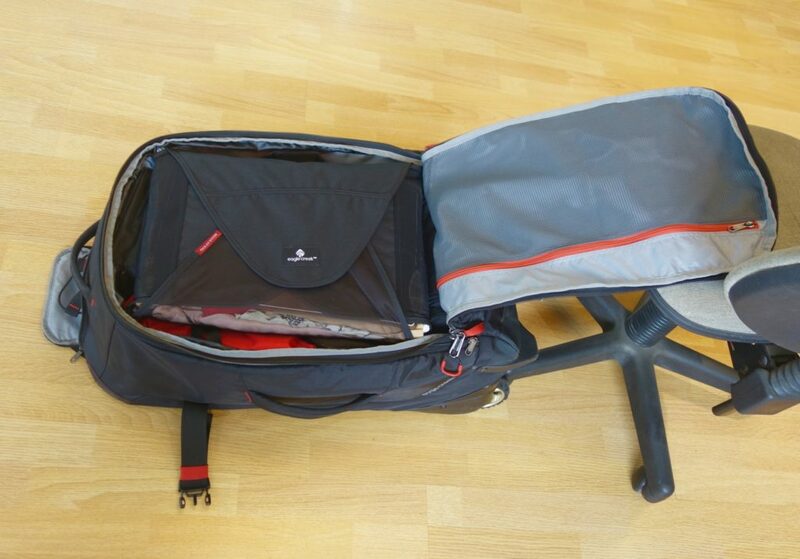 The main concept of packing bags is compartmentalisation. Every personal item and clothing group has it’s own packing bag. Toiletries – This is the bag that weighed the heaviest for me. I used a Samsonite toiletry bag which worked well with the packing cubes. You need every cube / bag to hold its shape. 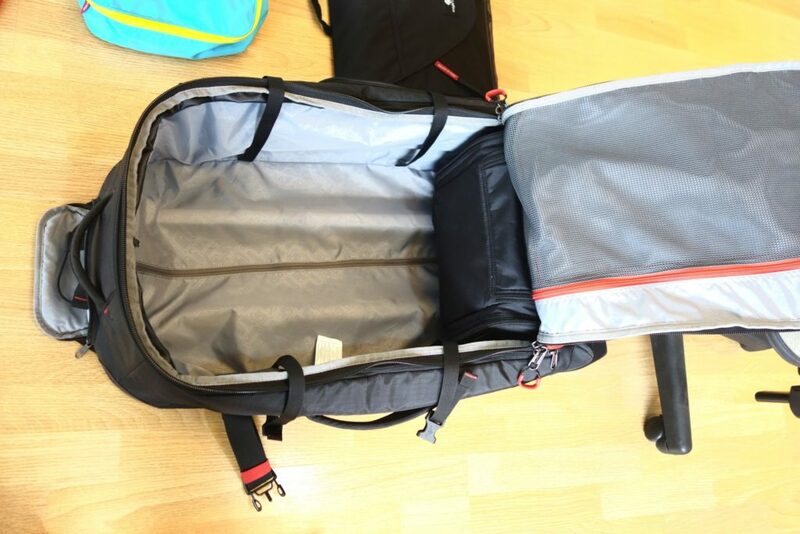 Because using packing cubes can be like playing tetris inside your luggage space. The more the cubes / squares fit, the better. Pants – When I took this photo, 3 other pants were in the wash so I actually packed 4 pants, rolled together inside 1 packing cube. Tops/Shirts – I forgot to put that I included pajamas in this cube as well. This cube is for those low-maintenance tops that can afford to be wrinkled. Formal Shirts/Dresses (Packing Envelope)- This packing envelope was a revelation! It’s my first time to use it on this trip. It’s for those kinds of clothing that need a little more TLC. (silk tops, dresses, etc). It includes a folding board folding/stacking instructions so that your clothes won’t require ironing. This envelope was also great for storing dresses. 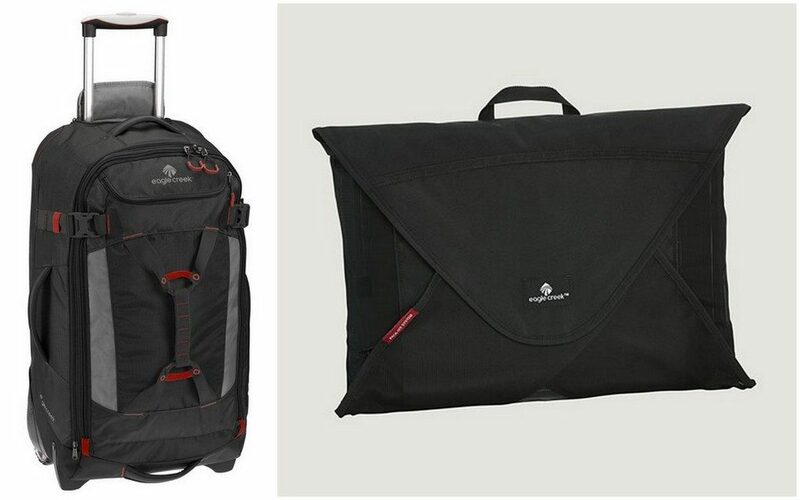 Sandals/Going Out Shoes and Sneakers/Outdoor Shoes – Packing cubes come in different varieties. There’s one made specifically for shoes. One bag is for a pair of footwear, but I find that I can fit two in one if it’s the sandal variety. I brought two shoe packing cubes in this trip. The first one I used for my ‘going out’ sandal wear. The other bag was for sneakers and another open-toe outdoor /sporty sandal. Bikinis/Swimwear – this also included kaftans and anything related to the beach / swimming. Underwear – the more the merrier! Ok kidding, I always bring extra. Workout clothes / socks – so you won’t have an excuse not to get moving! Laundry Bag – I brought a separate one and placed it in the laundry chute part of the bag. Chargers/Cables – a definite ‘must-be-placed-in-a-separate-bag’ item. Id hate to spend my travel time untangling and looking for cables! Makeup Bag – for this trip, I was really minimal and used a small case. I normally would travel with two of that makeup case! Step 1: Find the heaviest packing cube / bag. Whenever I travel, the heaviest piece of bag / packing cube is always the toiletry bag. I need my paraphernalia with me. I will do a separate post soon of what I pack in my toiletry bag , but for now, allow me to say that the heaviest piece of item should be placed at the bottom of the Load Warrior bag. So this will only work if the heaviest cube/bag DOES NOT contains fragile and breakable items. Sure my toiletries bag contains liquids but that toiletry bag is in itself very sturdy and made with very firm (unbendable) padding, so it worked very well. The reason why I placed the heaviest at the base of the bag: this will help maintain the bag’s balance and “posture”. It’s all about weight distribution for ease of carrying the bag around. The next 2 heaviest / largest cubes in this group are the cubes for pants and the ‘low-maintenance shirts’ and pajamas. Now, we have our first layer of packing cubes which is comprised of the heaviest / largest items. Step 3: Medium sized cubes go next! For the second layer, I packed on the medium sized cubes – the ones containing workout gear, underwear and swimwear. The idea is to have everything as level and as even as possible. Ok, they may not be lighter than the second layer made out of medium cubes. But the idea here is to place irregularly shaped cubes / containers last. 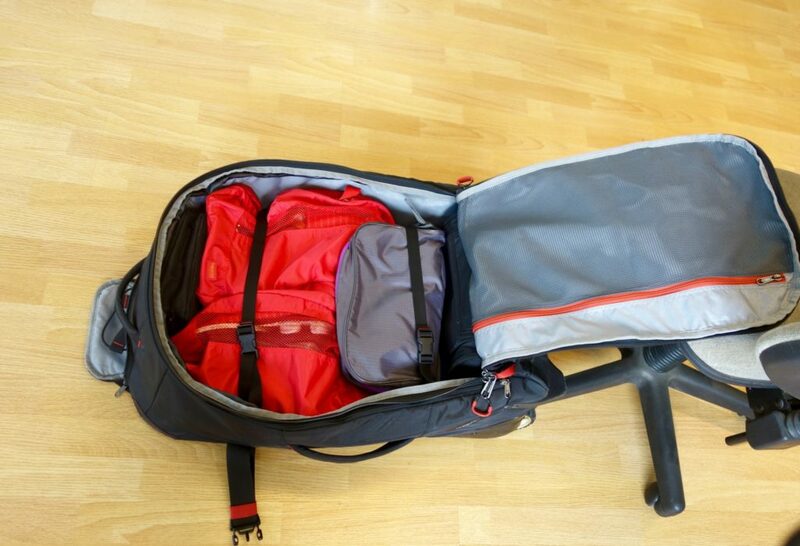 This is so you can maximise the space in the bag. Steps 1-3 was done to ensure that no space in the bag is left unused. If we put the shoes in first, then there will be lots of gaping holes/spaces. At this stage, I also placed the charger and makeup bag, which can be slotted in the small crevices in between cubes. I then made use of the internal compression belt. Using this ensures that the cubes remain steady. How to Pack with Packing Cubes: Packing envelope goes on top! The beauty of the packing envelope, apart from keeping your ‘high maintenance clothing’ wrinkle-free, is that it is sturdy, and because it also comes with a folding square / guide, it maintains a perfect rectangular shape. Now this goes on the top layer in order to help keep the overall shape of the bag. This also helps in zipping up the bag. 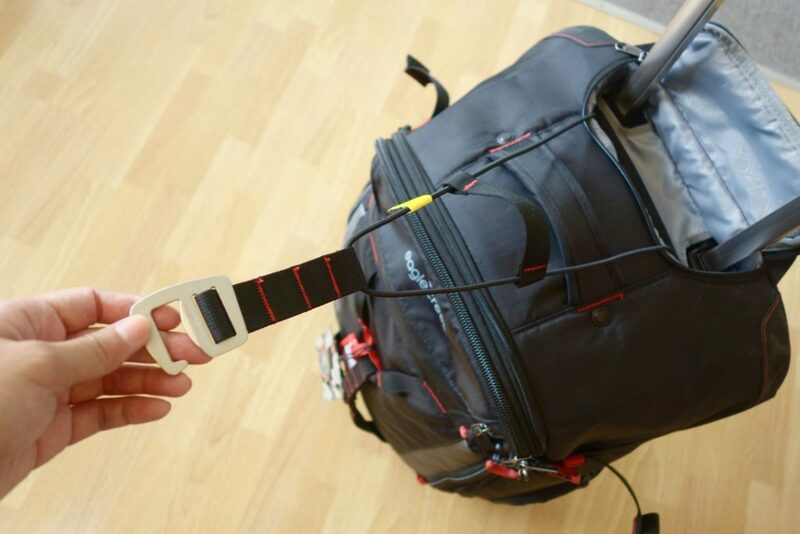 After you’ve zipped the bag close, use the external compression strap and firmly clasp it close. This helps maintain the bag’s balance and posture. Most of all, when you need to use the extra allowance zip of the bag, it really helps in reducing the bag’s size. I like to think of it as a belt that helps the bag ‘hold it in’. And there you go! What do you know, I had exactly 15 kilos of things on the way to the Philippines. The Eagle Creek Load Warrior and the packing cube system really made my life so easy! I would best describe the bag as perfect for those who do like to go on adventure trips, but are not quite backpackers. And the thing I find great is that even though I packed just 15 kg of clothes and things, nothing was sacrificed, I still managed to pack how I would normally pack in 2 weeks even if the luggage allowance was higher. (The only thing I left behind was a second makeup bag which I managed to do without). And because I’m so happy to have found this revolutionary system in packing, I’m sharing the love, y’all! Eagle Creek has been very kind to supply me with a new set of Eagle Creek Load Warrior and a packing envelope to give away to a reader! Holy Smithereens Giveaway! Win an Eagle Creek Load Warrior 28 bag and a packing envelope! Are you a light or heavy packer? Where will you take the Eagle Creek Load Warrior 28? This is open to Australian residents only. Only one winner will be randomly drawn. This winner will receive both the Eagle Creek Load Warrior 28 and the packing envelope. Winner will be randomly chosen, and will be notified via email. Disclosure: I was given 2 sets of the Eagle Creek Load Warrior 28 and Packing Envelope by Eagle Creek. One set is for the purpose of a review, of which I've stated above all my personal opinions, and the other set is for a giveaway. I worried I’m a heavy packer.I’m off to Fiji this month with my 3 girls.This is my first plane trip,so i haven’t had alot of experience packing.Beauty produts for all 4 of us is my biggest worry as we will be away nearly 2 weeks.my girls pack alot for 2 days away.Eagle Creek Load Warrior 28 made packing look easy.I would love to be considered to win this amazing prize. I am travelling to asia next year with my young family. My husband and I lug 3 odd size bags around the airport while juggling the two kids. Somehow, I manage to over pack everything for the kids and my husband and I always forget to pack everything I need!! It’s horrible arriving in a foreign country and realised you have forgotten to pack some of your creature comforts from back home The Eagle Creek load warrior 28 will remind me to pack everything I need in these compartments and make packing easy!!! I try my hardest to be a light packer, but things always get ‘slipped’ in throughout the packing process and I become one of the heavy packers much to my dislike! The Eagle Creek Load Warrior 28 will be hopefully on the next plane trip I take to see family and friends in QLD, with two children and minimal packing space I hope that I can learn to become a light packer using this item! I’m a heavy packer. Always take too many jeans. I would take the Eagle Creek Load Warrior 28 to New York. I start light, think Im casual and all smart… then I start to get anxious, and think….what if…and …just in case… I’ll just add this and I think last second before the case closes for good I’ll just squeeze in that…… so really Im a heavy packer inspiring to be a light packer. Ive never used anything like the Eagle Creek Load Warrior and I am sold on the packing envelopes and cubes, next trip just watch me…. cube it up! Like you, I fit into the ‘medium’ packer category. I don’t really have any great desires to be a carry-on only traveller but I do want to be able to lift my suitcase off the ground! I haven’t been over 20kg yet when checking in – even after two months in Europe with LOTS of shopping. 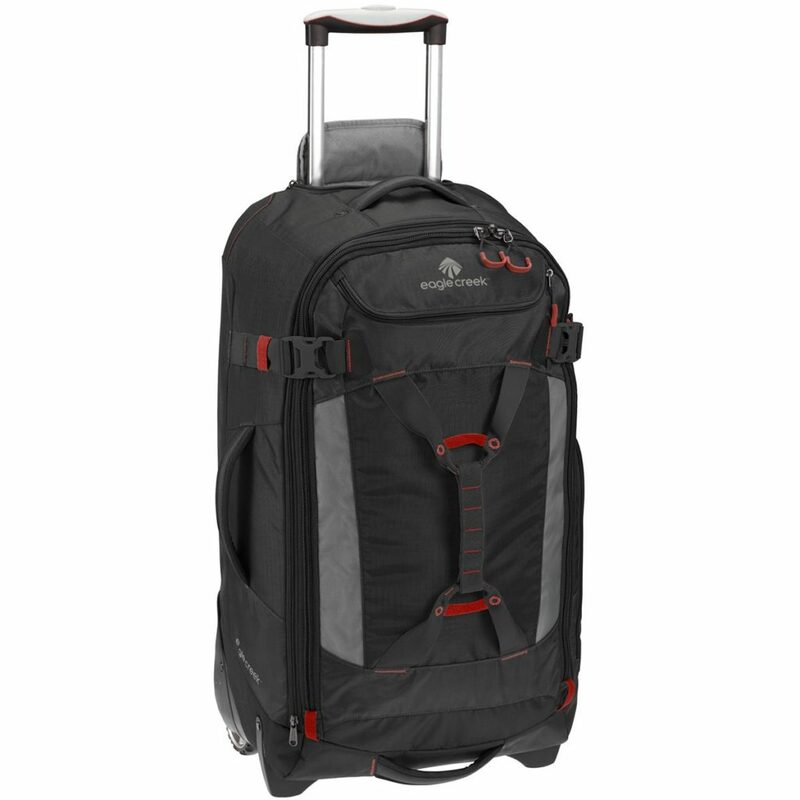 I’d love to win the Eagle Creek Load Warrier 28 to use on my future travels. Next up are trips to New Zealand, where I’ll be combining both a walking holiday and a conference, and then to Europe for my annual two month trip. In my 20’s, I backpacked around Europe, U.S. and Alaska so had to be a light packer. Now I am older and no longer backpacking, the rolling suitcase saw me become a heavier packer bringing back gifts on my way home from my travels. Would love to go back to my roots, especially taking it to Cambodia and Vietnam. I’m a light packer, until I find a bookstore. 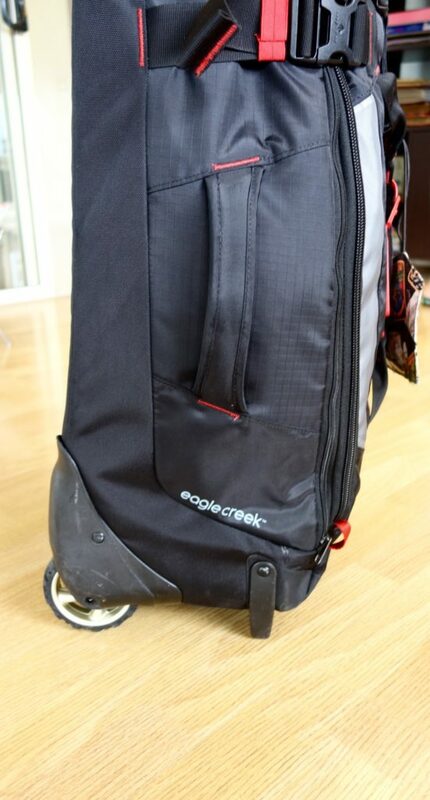 I’ll take the Eagle Creek bag to the UK to meet my fiance’s family before we get hitched!! I tend to be a heavy packer. My husband has taught/made me lighten my load over our travels. I would take this when we travel home for holidays as well as our travels to Mexico in the summer! Thanks for the chance this is a reAlly neat giveaway! I tend to be a heavy packer because I want to make sure I bring everything that I (will probably!) need for the trip. Better to come prepared I always say. Our next big trip is scheduled next year, hopefully visiting the U.S. on my 40th! Really looking forward to making it a reality. An informative, detailed post. Considering I’m on the road all the time, I should be a light packer but am not. 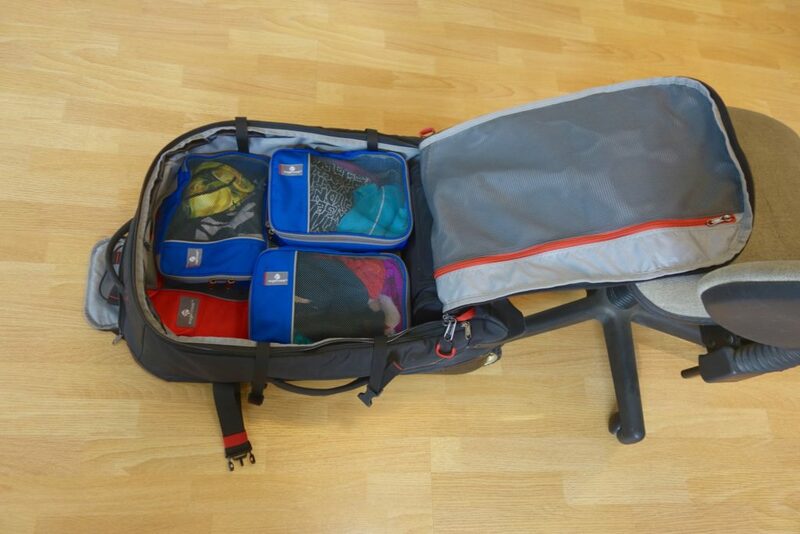 Packing cubes are essential, and a tip with using those is to use different colours for different types of clothes. Blue cubes always contain shirts, brown cubes always contain pants, black cubes always the extras (swim wear, thermals, sleep wear). Very easy to find what I need quickly. I am a light packer. And I actually have some of the items you used for packing! If I was to be the winner I would take this bag with me from California to Puerto Rico, then to Florida and finally back to California. Not to forget all the trips that we do in California! We love to travel and this would be a great addition for our family of 3! This looks perfect. I am getting better and better at packing but having the Eagle Creek bag will make my life even easier as we dash from one place to the other. 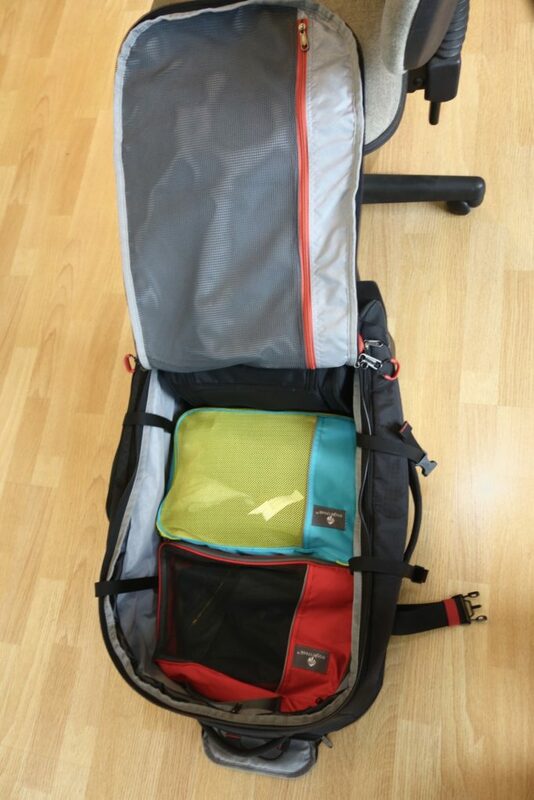 Colour coded packing cubes are genius. I do use packing cubes and love them, but mine are all of the same colour. Unfortunately, so is my wardrobe – black. So it is a never ending scramble to remember which black item I need is in which packing cube. As I always have to take formal gear for dinners and meetings I can see the Eagle Creek Packing Envelope being perfect. I think myself as a medium packer but would like to be considered a light packer. Next trip is Hamilton Island but am thinking Europe next year for 3 weeks. We will be traveling on trains so this system will be ideal. Thanks for the tips. I have travelled with and without packing cubes. Both have pros and cons. The idea is genius- the one drawback is if you are moving around a lot and have to unpack and repack over and over. I can never seem to get my toiletries bag to weigh less than a brick- it’s a big problem for me. I look forward to your tips! I usually like to pack light when I travel for holidays because I am expecting to do some shopping too. I normally use Samsonite medium size luggage because they claim that they are durable and have a life-time warranty. The previous Samsonite I bought was in LA and I bought it in 2012. The wheel was broken so I asked my sister to buy me a new one as her Christmas present in 2014. I just came from my holidays in Europe and mainly stayed in the cruise and the wheel of my new luggage is again broken. I suspect that the luggage got thrown away and the wheel get broken when they load and unload the luggage on the plane. Anyhow, I want to buy a better travel luggage that is light and durable. I would like to give this Eagle Creek a go. Plus I love the idea of the cubes. But I am reluctant to buy soon because I just got this Samsonite and maybe I have to search where I can have it fix. As a guy, I am too lazy to sort my stuff and sometimes the dirty clothes can get mixed with the clean one..and the nice clothes for fancy dinner get crumpled from the packing. 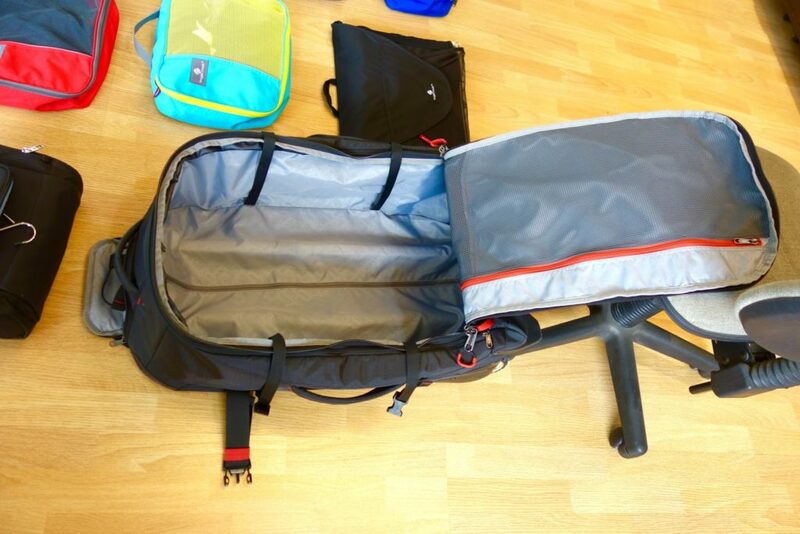 This is an amazing post on how to organize stuff when travel. Going to asia soon and it is always a challenge to fit everything in the luggage with so much stuff to buy. Looking at Eagle Creek Load Warrior 28, it looks so lightwieght. Thanks for the wonderful tips on how to organize things when traveling. These would really make going from one place to another so much easier. As a usually heavy – “cause you know, you might need that” packer, I love your tips and am looking forward to putting them into practice on my first ever overseas trip to the UK next year ???????????? I’m a roller coaster packer. I start off laying everything out I think I ‘might’ need (which is usually a lot). Then I seriously trim down to bare minimum. And then at the last minute I throw in ‘just in case” items. Luckily the final amount doesn’t usually equal the initial pack. Love the idea of the cubes. Will help the packing issues for France and Ireland next year! On our last overseas trip, our case was only half-full (thanks to packing cubes!! ), which left us a lot of room for new stuff. 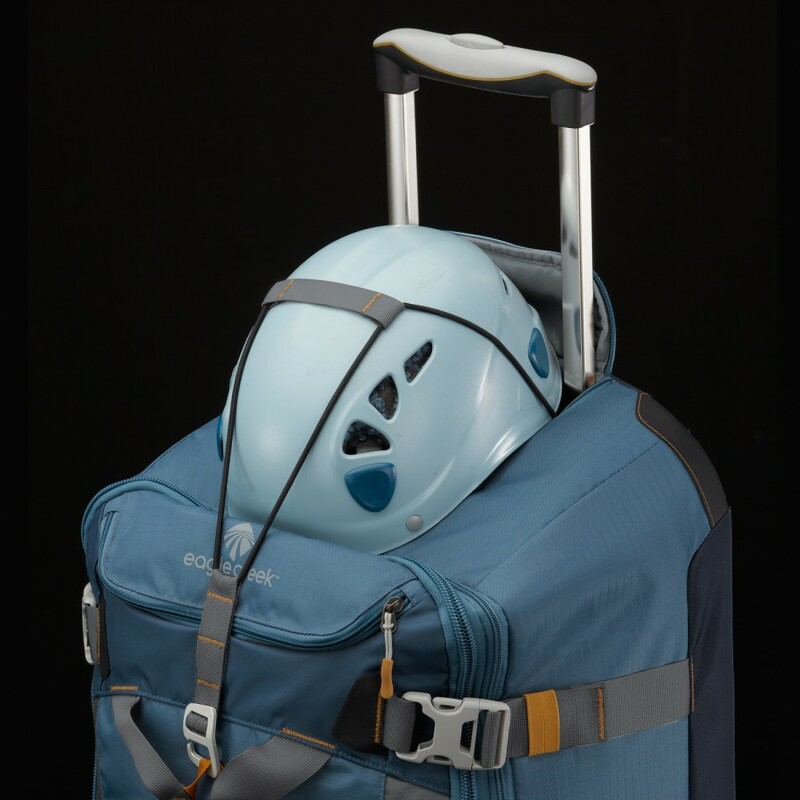 I’m a heavy packer, and that’s even when I don’t have the kids with me… I think after years of carrying backpacks, I now use trolley cases and so it’s easy to get them around. I also tend to pack very late and chuck everything in – story of my life. This looks an excellent bag and I’d take it to Bhutan and Bali…. in my dreams… and to Ballina and Byron in reality. You’ve totally sold me on packing cubes! Where do you buy them from? And the laundry chute is a great idea. I put them in a separate bag but it’s good to keep it separate! I’m a light packer and I love packing cubes. I like the laundry chute on this bag. I’d love to take an Alaskan cruise with this bag. I am a heavy packer. My husband and I are planning a trip this summer from Hawaii to Europe for our honeymoon. I haven’t been able to try any of the products you listed, but have been looking at reviews for packing cubes and the best ways to pack for our trip. Hi Gee, for a long trip with varied weather (Hawaii and Europe) I would probably take a bigger case with 4 wheels, but still take the packing cubes – those go with me whatever luggage I use. Enjoy the honeymoon! This is too late for the giveaway but I wanted to say I enjoyed this and add a comment. I take chargers and cords in a pouch that’s smaller than the smallest packing cube (which I love by the way) but because whatever you pack them in doesn’t keep them apart, I’ve discovered wrapping each cord in a pony tail band (those covered elastic bands) – and they work brilliantly. Take up minimal room and weight and add to one’s ability to organise! I always over pack and struggle with heavy suitcase – need to improve for my girls trip to Canberra next month! Would love this! I would say that I am an in between packer, I try to be light but some how I end up over the weight and to start subtracting is a phobia of mine. The organisation that you bring is a godsend, it looks so easy, I would love to be able to do that. Me and some girl friends are off to the cook island and the Stowaway Equipment Keeper would be a perfect addition to anyone suitcase, ideal for me to carry my full face snorkel. What a fantastic suitcase!